The Church of St Michael (kostel sv. Michala) originally a Romanesque structure, is older than the New Town (Nové Mĕsto) itself, which started to evolve in the place of the fields and meadows, settlements and villages in 1348.
the Lutherans a hundred years later (1524), and then the Catholics after the Battleof White Mountain (1621). It was then bought by the German Lutheran Church in 1790 alter being abandoned. The German choir had a picture of Martin Luther created for the side window of the church in 1915. After the Second World War, the confiscated church was passed to the Prague choir of the Slovak Evangelic Church. The Gothic structure of the church dates hack to the last 25 years of the 14th century. It was expanded and added to on a number of occasions, with its final re-Gothicisation dating back to 1914 – 1915 under the leadership of builder Štěpán Koloschek. The old Romanesque church was pulled down sometime before 1369 and subsequently replaced with a new Gothic structure. Baroque extension of a staircase to the gallery sits next to the southern Gothic nave. The structure comes to a peak with its slender prismatic tower, which has Gothic core. The portal from the north is fitted with a fanlight, whose tracery was made up of a number of stylized nuns. The late-Rococo main altar (around 1770) remains the Gothic fittings. This was originally dedicated to St. Michael. There is also a picture of Christ blessing bread and wine (1870). The baptismal font comes from around the same time. The organ meanwhile, dates back to the second half the 19th century. Rev. Tony Booker (http://www.lcms.org/booker) will be installed as pastor of the English congregation at St. Michael’s in Prague on 9 October 2011. 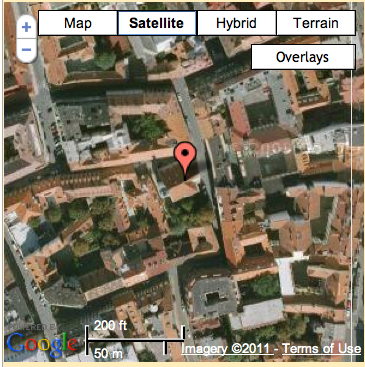 Location of Saint Michael’s in Prague. Print article This entry was posted by Al Collver on October 2, 2011 at 10:22 am, and is filed under Al's Posts. Follow any responses to this post through RSS 2.0. Both comments and pings are currently closed.